Two months of jaunting through Morocco and we finally arrive at Bab Boujeloud, an ornate blue and green tiled gate marking the entrance of the Fes Medina. A labyrinth once feared by tourists as impossible to navigate alone, the city has installed colored arrows directing self-guided tours, and now the hassle from official and faux guides is almost nil, and the lure of getting lost impossible, well almost. 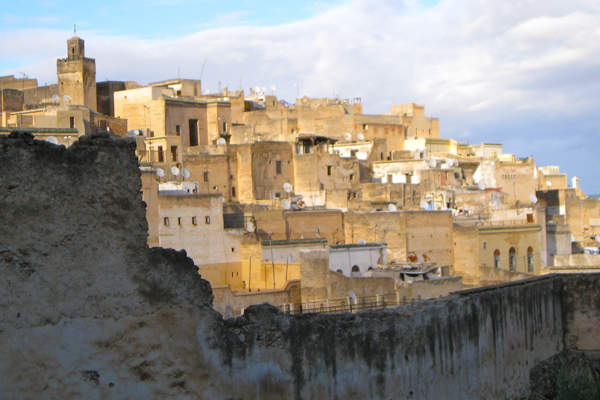 Founded in the 9th century and now a UNESCO World Heritage Site, Fes was an urban mecca housing the world’s first university. Change comes at a sluggish pace, donkeys laden with heavy crates still transfer goods through narrow alleyways, ‘Balok, Balak’- look out, the driver shouts, pulling his animal through the crowded passage. Our roof-top chamber locked from both sides and the barred windows felt a bit like prison, but our voyeuristic perspective of the winding passages below were well worth the 100dirham, 14$, for Pension Talaa. Did I mention the shared toilets and showers downstairs? For 4 days we wove through souks (open-air markets), fondouks (enclosure housing tradesman upstairs and his animals and wares below), medersas (Islamic schools), fountains, mosques and palaces all woven into the walled fortress, where monuments from centuries back remain standing. Following behind, we end up at the edge of the Medina where women and children clutch mint under their noses and faux guides offer ‘Tanneries, this way,’ with a walk through a cousin’s leather shop first. For 10 dirham, we pay to avoid the shops and enter the ancient tanneries alone, observing the toxic primitive techniques. Animal urine is used to soak the dried pelts, removing any stray hair and dirt while Pigeon excrement softens the leather. 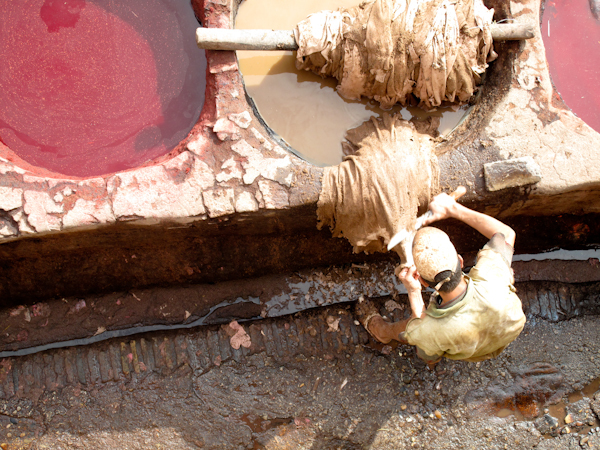 Under the sweltering sun, men draped only in shorts, knee deep, lower the skins into toxic colored vats. The leather emerges dripping of bright, beautiful blues, saffrons, crimson and are spread atop the roof rafters to dry before another donkey hauls them off to the leathersmith. As my camera captures the images, a wave of guilt washes over me. Rounding a mederesa, children’s giggles rise above the 4pm call to prayer as they race outside, scattering under our feet. We fill our bellies with 5dirham hand stuffed chickpea and hardboiled egg sandwiches off the street. The Medina lures us deeper, offering treasures at every turn, until looking up, we are again lost in her labyrinth.